If you’re looking for a great way to improve your cardio, burn a lot of calories, improve you strength, flexibility and build a lean, athletic physique then our fitness classes might be the perfect solution for you! With a background in martial arts you’ll be punching, kicking, running, skipping, pushing, pulling, flipping tyres and slamming medicine balls. All our classes are high-intensity with short bursts of intense activity. 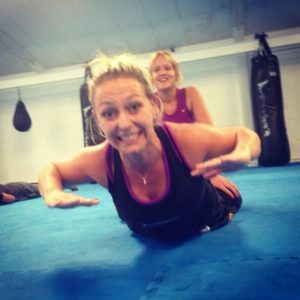 We have a range of fitness classes and many of our Muay Thai, Boxing and Brazilian Jiu Jitsu members train because they’re looking for an interesting way to get fit – something different to normal gyms. In addition to our fitness classes we also run a variety of martial arts classes which are a fun and interesting way to get in great shape. If you’re looking to try something different our Muay Thai, Brazilian Jiu Jitsu and Boxing classes are all great ways to get fitter, stronger, improve you co-ordination, flexibility, mental toughness and learn to defend yourself. In addition to our 40+ classes per week – we also have kids martial arts classes 6 days a week and offer 1-2-1 martial arts tuition and personal training. I’m a beginner and not very fit, will I be ok? Everyone has to start somewhere and while we’ll push, encourage and motivate you to work your hardest it will always be to your level (which will go up and up, and up as you get fitter). Our trainers will look after you! Will I get hurt? No, definitely not. Our fitness classses are pure fitness – no contact takes place and our Ladies Muay Thai is a combination of technical and fitness orientated. In our Muay Thai, BJJ, Boxing and MMA we do spar and take it very seriously to make sure they are always very safe, paired correctly. Sparring is always strictly supervised and only for members who are technically and physically ready. To find out more about any of our classes click on one of the links above or get in touch and one of the team will be happy to help you.